Before I came to college, I used to hate mushrooms. Something about the flavor and texture of them used to turn me off to them. But since I tried portobello mushrooms freshman year, I fell in love. I enjoy almost any type of mushroom now (still not fond of the white button mushrooms, though). This mushroom recipe is very simple, quick to make, and tasty! 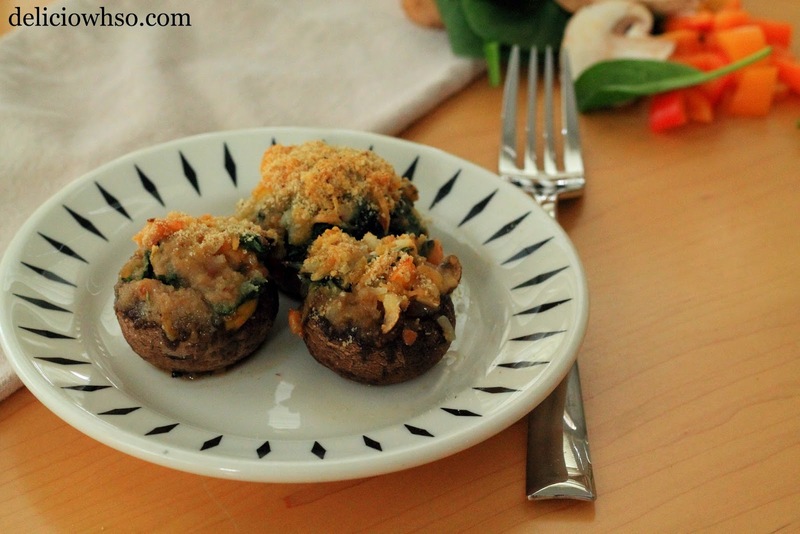 Many stuffed mushroom recipes have some sort of seafood in them. I decided to try a different approach. 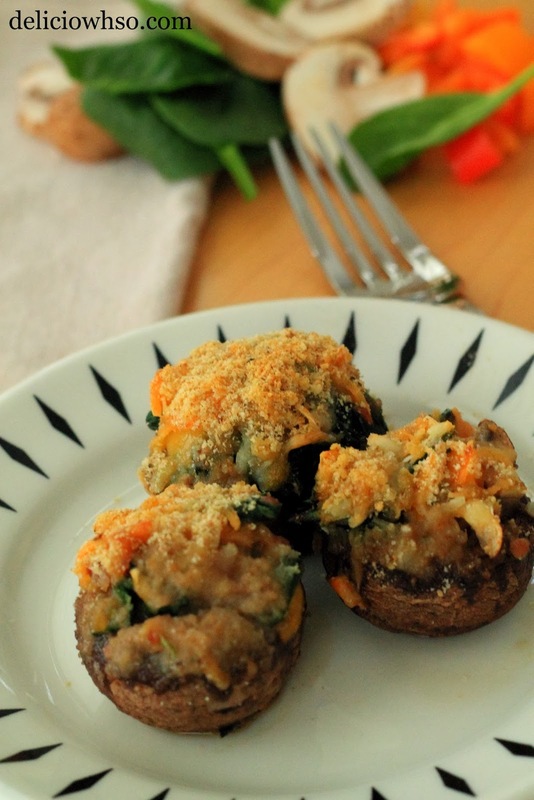 Filled with veggies, cheese, and bacon bits, this recipe brings a fresher and healthier approach to the usual stuffed mushroom. 2. Remove the stems from the mushrooms (if there are any). Dice into 1/4 inch cubes. 3. Roughly chop the spinach. Cut the tomato, onion, and bell pepper to about 1/4 inch cubes as well. 4. Heat a pan with the oil. Once hot, add the vegetables, salt, pepper, and garlic powder. Allow to cook until the veggies are seared and slightly tender. 5. Remove from heat into a bowl and mix with cheese and bacon bits. 6. Stuff mix into the mushrooms and put onto an aluminum lined sheet pan. 7. Mix breadcrumbs and Italian seasoning in a bowl and put some on each mushroom. 8. Bake for about 20 minutes, until the mushrooms are tender. 9. Remove from heat and serve warm. The mushrooms taste almost like an omelet (the filling would be a really great omelet filling, too). The veggies and cheese definitely bring that effect. However, they taste cleaner and fresher. These mushrooms are a great appetizer for any party, and they're quick and healthy. You can make this a vegetarian dish by simply omitting the bacon bits.